Run, Jump, Flip, Twist and Swing through objects and obstacles in an efficient manor. Develop skills to be taken virtually anywhere. As seen in major motion pictures, used by stuntmen (and women) and fight choreographers, “Ninja Zone” helps develop young athletes into insane tactical athletes! 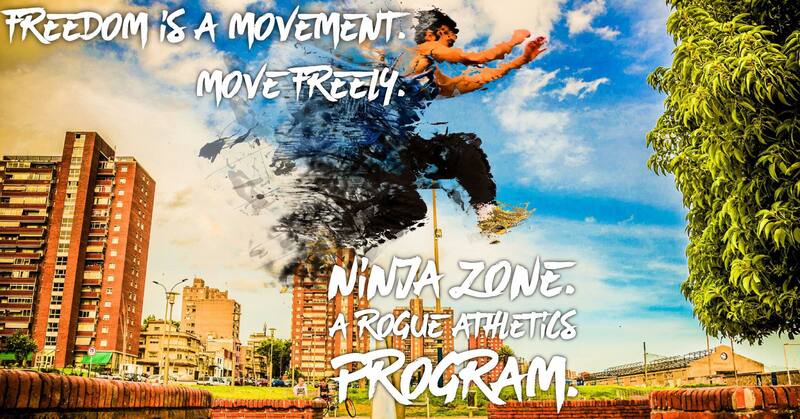 Run by certified instructors in all things movement, the Ninja Zone program offers a unique blend of street-wise artistry to Rogue Athletics! Ninja Zone is a global movement that involves Urban Gymnastics, Movement, Training, Discipline, and Confidence. Rogue Athletics has expanded its use to training athletes to use their skills outside of gym! With coaching, training equipment, and developed workout plans, students can jump, climb, flip and run in confidence in a safe environment.Check out our Ninja Zone classes and clinics TODAY! After Rigorous training, some advanced athletes will be asked to join the “Ninja SQUAD” ! This invitation only group will go to “Jams” and “Meet ups” outside of the gym to test their skills against other area athletes!